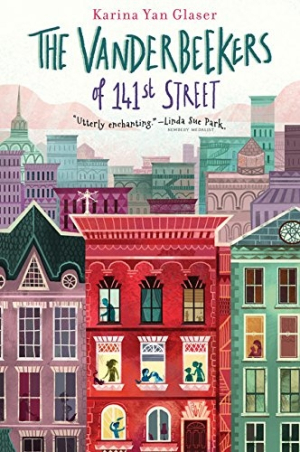 Karina Yan Glaser’s The Vanderbeekers of 141st Street is a thoroughly charming book. For six years, the Vanderbeekers have made their home on the bottom two floors of a brownstone in Harlem. Mr. Vanderbeeker grew up in the neighborhood, and this is the only home that his five children have ever known. But just as Christmas approaches, their landlord, Mr. Beiderman, tells Mr. Vanderbeeker that he will not renew their lease. The family will have to move by the end of the month. The children do not want to accept this; they begin to plot ways to convince Mr. Beiderman to let them stay. All of the children are written with unique personalities and characteristics; each adds an interesting element to the book. The family is appealing, and their household is filled with chaos, creativity, and love. Mr. Beiderman is a mysterious figure, one the children have never seen, and their attempts to charm and impress him are sweet and innocent, though they seem to fail each and every time. The book offers a wonderful lesson about sympathy, and that the reality of a situation may be far different from what is imagined. The children assume that their landlord is simply a mean old man, but as they try for the first time to learn more about him, they discover that that may not be the case. The Vanderbeekers of 141st Street is a delightful story about a delightful family. It is a thoroughly enjoyable book that will undoubtedly find a place of honor on many bookshelves.